Lou Dillon (left) and Sweet Pea arrive to their new home and paddock. NOTE: We have broken this story into three parts because it is pretty long. This is Part Three of Three. If you haven’t read the first part of this story, please be sure to read Lou Dillon Rescue- Part One and Lou Dillon Rescue- Part Two first! We pulled up to Hanaeleh right around 4pm with Lou Dillon and his friend Sweet Pea chillin’ in the trailer. The driveway was too muddy to drive up, so we had to park on the street and walk the horses up. Elizabeth had called a few people to help us unload the horses, and they showed up just about a minute after we parked – yay! We opened up the trailer and took Sweet Pea out first- she was a little sweaty, but just where she had pressed up against he pads in the trailer. As soon as she walked out, Lou Dillon got very upset and began yelling for her, but we immediately went back into the trailer and backed him out without a problem. The horses were a little dazed and stressed from the trailer ride, but seemed no worse for wear. I handed Lou Dillon off to another person while I buttoned up the trailer and we walked the two up the road to Hanaeleh. The Hanaeleh horses were very interested in both Sweet Pea and Lou Dillon as they walked up the road- every single horse walked up to the front of their stalls to see who the newcomers were. Lou Dillon and Sweet Pea were interested in seeing them, but I didn’t want them to rub noses with anyone until they had their shots. Neither horse seemed too concerned about formally meeting anyone that day, however, they were fine with following us up the hill to the top paddock. Lou Dillon rolling in his new stall. We put the horses in the quarantine paddock and took off their halters. They both put their heads down, sniffed, and immediately dropped and rolled around in the soft sand in the paddock. Both were stiff from arthritis, but managed to get up and down without an issue. They meandered around the paddock a little, and seemed content. We took a few pictures and video to document their new home, although they were more interested in figuring out what was out beyond the paddock walls. Sweet Pea squealed a little at Lou Dillon, but only once, and that seemed to be that. We watched them for about 20 minutes and everything appeared wonderful- they really seemed to be the bonded pair we thought we were picking up. We brought them each a flake of alfalfa, which they both began eating without fail. Everything seeming great, so we walked away and began doing some barn chores. About 15-20 minutes later, one of the volunteers came up to Elizabeth and told her that it looked like Lou Dillon was attacking Sweet Pea. “Well, then, you shouldn’t have tried to kill her,” I said. “Well, maybe you can think about what you’ve done, and how you should treat a lady in the future,” I advised. Lou Dillon gave me a look, and then yelled again. I just shrugged and walked Sweet Pea down the hill and put some salve on her cuts, then put her into our only other open stall. She seemed happy enough in the stall, and immediately rolled again in the shavings. She and the neighboring horses said hello- in various ways- and she seemed fine that afternoon. We think that the extreme change in temperament had to do with food. Lou Dillon has obviously been starved for a very long time, and Sweet Pea was starved in her past as well, so they most likely had a small squabble about food, even though there was still plenty left in the stall. In order to try to reduce food aggression, I gave Lou Dillon a slow feeder hay net with two flakes of orchard in addition to another flake of alfalfa. He sniffed it and then looked back at me like he didn’t understand what to do with it. After a minute he took a bite, then walked around and yelled about how he was all alone again. It was starting to get cold that evening, so I pulled a blanket out from the shed and put it on him. Usually I just slide the blanket over the horses’ heads, but since I didn’t really know him, I gingerly placed it on him before buckling it up. He seemed fine with it, although a little confused. Otherwise, he didn’t seem to be bothered by it. We made Lou Dillon and Sweet Pea a very small bit of grain with some electrolytes and joint supplements. Both of them had the same response: they sniffed it, then pulled their head up, looked at me, confused, then sniffed it again, and took a tentative bite. They looked at me again, as if they had just discovered ambrosia, and began eating more resolutely. They now look forward to their grain buckets and nicker when they see us bring them. That evening I was still concerned about Lou Dillon, and I gave him a calming cookie so he wouldn’t be so upset over being alone. He wasn’t running around the paddock or anything, but he wasn’t happy or content, and I didn’t want him to colic. I couldn’t put Sweet Pea back into the paddock, however, because I couldn’t take the chance that he would attack her again later that night. Finally, however, we had to just go and cross our fingers that everything was OK. Both Lou Dillon and Sweet Pea were just fine the next morning, and ate their hay and grain with gusto. Lou Dillon didn’t seem bothered by being alone anymore, especially since he had a lot of yummy hay to munch on. We didn’t really do much with the horses the next few days- it was pretty rainy and we just made sure they were dry and fed regularly. Thankfully aside from his incident with Sweet Pea, neither horse seems to have any other sign of food aggression, and both are pretty mellow. That Sunday (four days after their arrival), we had Josh, our farrier out. He balanced out Sweet Pea’s back hooves, and she immediately began feeling more comfortable; when we first brought her up to the ranch, she had an obvious limp. A week after her trim, however, she began moving more soundly. She will never been 100% sound, and we have her on Previcox to help with her arthritis, which has made her feel a lot better. She also has popped knees in front, most likely due to an old injury as opposed to just arthritis or a bone chip, given that they are both swollen and injured in the same fashion. Most likely, she was running and somehow fell on both front knees- I would assume either from tripping and not being able to catch herself because her head was being pulled up by a harsh bit, or from her hind legs being roped and her falling straight down onto her knees. We will never really know the extent of the abuse and neglect that she suffered before being picked up by the shelter, but her injuries don’t seem to bother her with the light exercise we’ve been giving her. Then it was Lou Dillon’s turn to have his feet trimmed. He was good with his first foot, but when our farrier moved to the left hind, he tried to kick out. We got the other three feet done without a problem, but he was obviously touchy on that foot. We weren’t sure if he had a behavioral issue or a pain issue, but either way, I told Josh to leave the foot alone, and we would determine the cause at a later time. Lou Dillon’s feet were chipped up but for the most part weren’t terrible, and it was a hind foot instead of a front foot, so we had some leeway with being able to get the foot trimmed. After regular exercise and some joint supplements, however, Lou Dillon is fine on that leg now and allows us to pick it up and clean it without a problem. He’ll be able to get all of his feet trimmed without a problem when Josh comes out again in a few weeks. The next day the horses had their first series of vaccinations. We break them up into two different trips so it’s easier on their system. They had their second series of vaccines this past Tuesday, and the horses will get their teeth done next Wednesday 4/3/19. We wanted to give Lou Dillon a chance to gain a little more weight first before we had his teeth floated because his teeth are pretty awful and we don’t know how long he will need to be sedated. Overall, a few weeks have seen a huge difference in both Lou Dillon and Sweet Pea. They have been inundated with a lot of love and it has really shown! A lovely family came out and bought them both new blankets, feed buckets and some brushes. The officer who helped rescue Lou Dillon came out and brought some carrots for both of them, and they loved the visit! Other volunteers have brought them carrots and apples as well. Lou Dillon in our arena – 3 weeks after rescue. When I or any other person walks up to his stall now, he looks at us eagerly, waiting for whatever treat he might get. He isn’t pushy at all, however, and is great while we groom him, walk him around the ranch, or let him run around the arena. Sweet Pea’s personality has also really come out- she has started to be a little Diva, and although she is not a big horse, she has no problem throwing her proverbial weight around. We had to have a little “talk” last week when she decided that she didn’t need to listen to me as I led her over to the round pen. I think she figured that she knew where we were going- she could just get their faster, so why bother waiting for me? We worked on stopping and backing up and walking for a few minutes until she decided that she would humor me. Every once in a while she still tries to get away with something, but for the most part she is a very sweet girl. We also learned how she bonded with Lou Dillon so quickly- she bonds to EVERY horse quickly. She is in love with Hershey- and Popcorn- and Licorice… essentially, whoever is next to her at that time. Thank you to everyone who made it possible for us to rescue these two lovely horses who were very much in need. Both horses are gaining weight and are healthy. So many people stepped up to donate to help pay for their hay, grain and supplements. People helped pay for their vaccinations, teeth float and other vet bills. 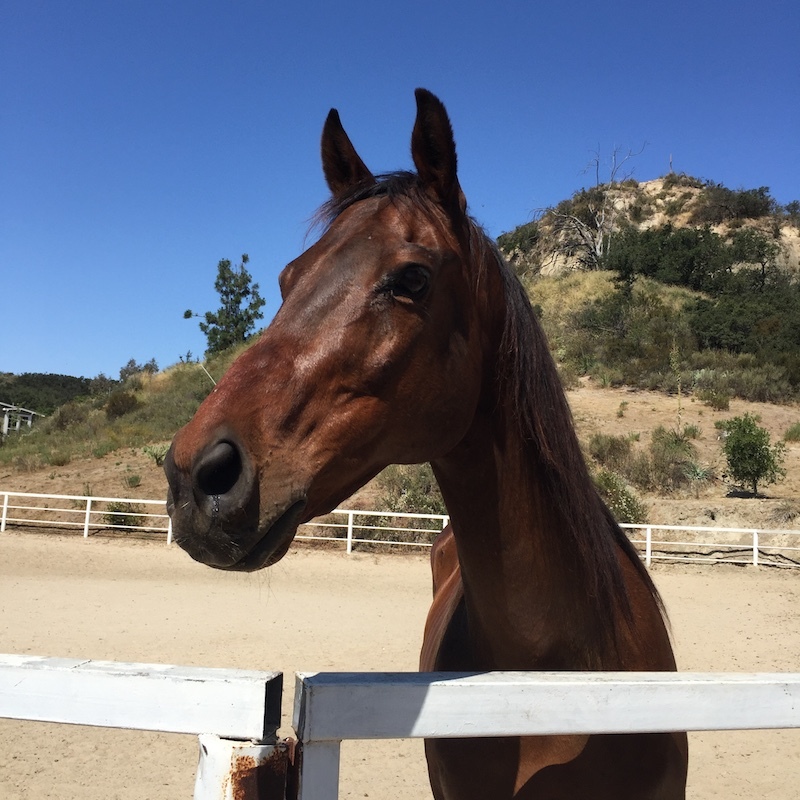 Equine Edge donated a 400-scoop supply of muscle mass for both Sweet Pea and Lou Dillon, and we will start them on that next week (we don’t want to introduce too much to them at once). The muscle mass has been very helpful in putting on weight on other horses we’ve rescued, so we are hopeful that this will help with both of these guys as well. From their new blankets, feed bowls and new brushes, it is obvious that these guys are now the recipients of a community of love. Thank you for helping them. Thank you to everyone who made such a big difference in their lives. Helping one horse- or two- may not make a huge difference in the overall scheme of things, but it made all the difference to their lives. They will never have another day without a meal. They will never have another day where they are mistreated. From now until the end of their lives, they will be safe.